For the Canadian Political party colloquially known as the Grits, see Liberal Party of Canada. For other uses, see Grit (disambiguation). Grits is of Native American origin and is similar to other thick maize-based porridges from around the world, such as polenta and mieliepap. The word "grits" is derived from the Old English word "grytt," meaning coarse meal. The dish came from a Native American Muskogee tribe's recipe in the 16th century, of Indian corn similar to hominy or maize. Traditionally from the southeastern woodlands, the Muskogee would grind the corn in a stone mill, giving it a “gritty” texture. They were made using a stone-grounder. The colonists and settlers enjoyed the new staple with the local Native Americans and it became an American staple dish. Traditionally, the hominy for grits was ground on a stone mill. The ground hominy was then passed through screens, the finer sifted material used as grit meal, and the coarser as grits. State law in South Carolina requires grits and rice meal to be enriched, similar to the requirement for flour. 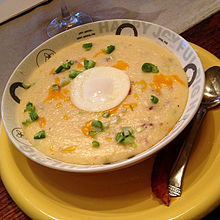 Three-quarters of grits sold in the U.S. are bought in the South, in an area stretching from Texas to Virginia that is sometimes called the "grits belt". 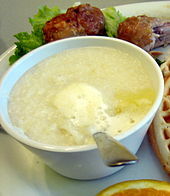 The state of Georgia declared grits to be its official prepared food in 2002. Similar bills have been introduced in South Carolina, naming it the official state food. Grits may be either yellow or white, depending on the color of the corn used. The most common version in supermarkets is "quick" grits, which have the germ and hull removed. Whole kernel grits is sometimes called "speckled". Whole kernel grits is prepared by adding four to five parts boiling water or milk (seasoned with salt—1/4 tsp for each cup of liquid) to one part grits. Cover and cook for 20 to 45 minutes over medium low, stirring regularly. Grits expand when cooked and need stirring to prevent sticking, and lumps from forming. They are not done until they have absorbed four and one quarter times their volume. Whole grain grits require much longer to become soft than do "quick grits." Some people serve grits with sugar, while others object to sweetened grits. They are often served with butter. They are served with grated cheese, sausage, bacon, or salt and pepper, or red-eye gravy. Extra, i.e., left-over, grits can be put into a glass tumbler or loaf pan, chilled until needed, sliced, and fried either plain or with a breading. In this form they are denominated "fried grits," "fried hominy," or "grit cakes." Grits are discussed in the 1992 comedy film My Cousin Vinny. Grits are used as a punishment for a teenage girl in the 2008 film The Secret Life of Bees. Look up grits in Wiktionary, the free dictionary. 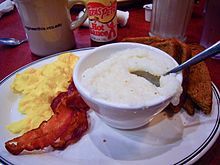 Wikimedia Commons has media related to Grits. ^ Marcus, Erica (May 3, 2006). "Newsday, Melville, N.Y., Burning Questions column: Kernels of Truth on Ground Corn". Knight Ridder Tribune Business News. Washington. p. 1 – via ProQuest. ^ South Carolina Code of Laws, Title 39 – Trade and Commerce, Chapter 29. Retrieved February 12, 2017. ^ Cutler, Charles L. (2002). Tracks that Speak: The Legacy of Native American Words in North American Culture. Boston: Houghton Mifflin. p. 28. ISBN 0-618-06510-5. ^ Georgia Secretary of State, State Prepared Food. Retrieved December 14, 2007. ^ South Carolina General Assembly 113th Session, 1999–2000, Bill Number: 4806. Retrieved February 12, 2017. ^ Lee, Matt; Lee, Ted (April 26, 2000). "A Taste of Charleston; Corn's Highest Calling: Grits". The New York Times. Retrieved March 17, 2018. ^ "Delicious Dessert Grits Recipe - Genius Kitchen". Retrieved November 13, 2018. ^ "Chocolate Grits Recipe - Genius Kitchen". Retrieved November 13, 2018. ^ "Southern Chocolate Grits n Berries". The McCallum's Shamrock Patch. Retrieved November 13, 2018.